Maeder, A.J., Ho, K., Marcelo, A., Warren, J. There is a changed emphasis in many health services, with conventional pressures such as budget and workforce constraints, combined with the indirect forces of social change and strategic direction, bringing about the need for more flexible approaches for the longer term. By enabling different care models and delivery channels, telehealth offers demonstrably effective and sustainable solutions for issues such as access to and quality of care. This book presents 18 papers delivered at the 5th Global Telehealth Conference, held in Auckland, New Zealand, in November 2016. 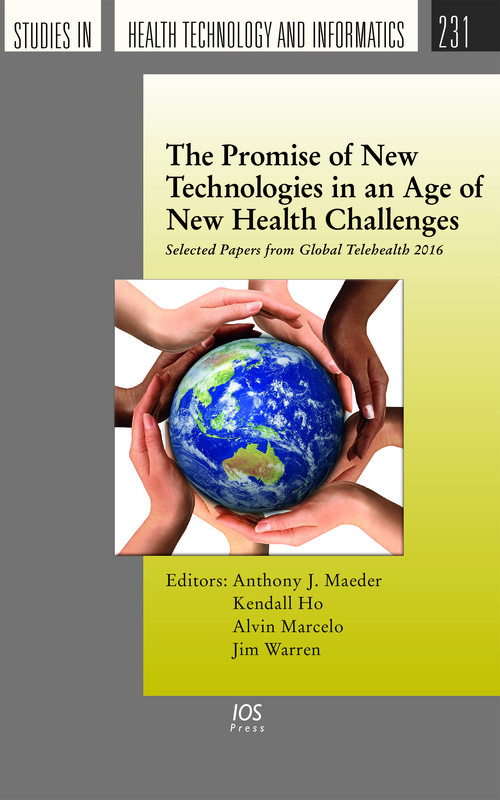 The theme chosen for Global Telehealth 2016 is 'The Promise of New Technologies in an Age of New Health Challenges', and the papers included here cover a wide variety of topics, from theoretical and abstract contributions through to discussions of practical projects and highly specific applied contributions. The book also includes two invited papers which detail recent contributions to two global issues in which telehealth plays a major role: universal health coverage and personal health monitoring. With papers ranging in scope from computer assisted screening technology for diabetic retinopathy to behavior change through computer games, this book will be of interest to all those involved in the design and provision of healthcare services.